Situated 5,000 meters above sea level, atop a vast, arid plateau in northern Chile, sits the Atacama Large Millimeter/Submillimeter Array (ALMA). Despite being only one-third complete, ALMA is already the most powerful telescope of its kind, and is well on its way to becoming the most technologically advanced telescope we've ever built. And now, for select research teams, it's finally open for business. Shown up top is a composite image of the Antennae Galaxies, the youngest and nearest colliding galaxy pair we've ever observed. The image comprises views of the galaxies taken with two different types of telescopes, combining data from ALMA (depicted in orange and red) with visible-light observations from the Hubble Space Telescope. The collision of the galaxies has turned them into what astronomer Brad Whitmore describes as "an impressive star-making factory." 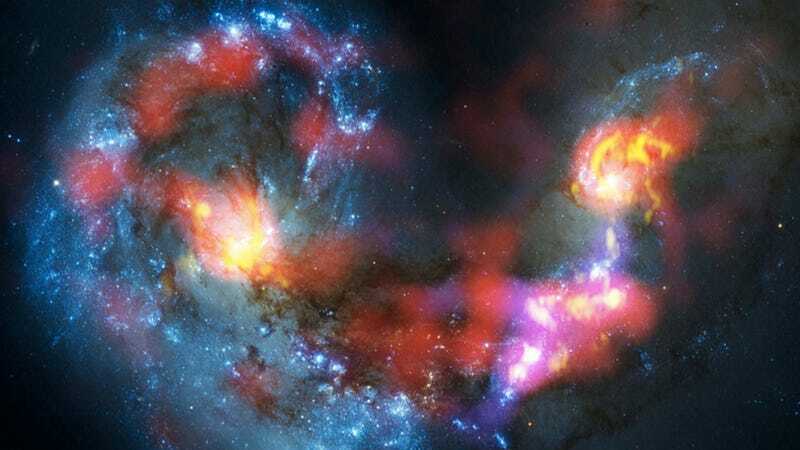 Whitmore leads a team of astronomers that is using ALMA to study star formation within the galactic collision. "ALMA's test views of the Antennae show us star-forming regions on a level of detail that no other telescope on Earth or in space has attained" said Dr. Mark McKinnon, North American ALMA Project Manager. Whitmore's team is one of the first to put the ALMA satellite network to the test. Theirs are among the first "Early Science" findings generated by the array — the "early" part being a reference to the fact that ALMA, despite its unprecedented power, still has a ways to go before it's operating at full capacity. That's because satellite arrays like ALMA work by combining the imaging capabilities of many individual satellite telescopes, connected by a network of fiber optic cables, to create one super telescope. Information gathered by each telescope is collected and processed by a supercomputer to generate meaningful data that can then be used to produce images like the one you see up top. The image shown here shows ALMA at its current stage of development. By 2013, the array is projected to be capable of drawing information from a total of 66 satellites — that's three times the current number. But satellite arrays like ALMA survey the Universe via wavelengths of light that are much longer (on the scale of millimeters) than the ones we perceive with our eyes (on the scale of nanometers). This allows them to observe cosmic events — like star birth and planetary formation — at levels of detail that cannot be witnessed by visible light alone. Shown here is what ALMA sees when it casts its gaze upon the colliding galaxies pictured up top. And among millimeter/submillimeter telescopes, ALMA is the superheavyweight champion of the world. "Even in this very early phase, ALMA already outperforms all other submillimeter arrays," said Tim de Zeeuw, Director General of the ESO, the European partner in Alma. "Reaching this milestone is a tribute to the impressive efforts of the many scientists and engineers in the ALMA partner regions around the world who made it possible." "ALMA's test views of the Antennae show us star-forming regions on a level of detail that no other telescope on Earth or in space has attained," explains Mark McKinnon, North American ALMA Project Manager. "This capability can only get much better as ALMA nears completion."